Arctic air in much of U.S.
A blast of cold air caused rain and wet roads to freeze across the Eastern U.S., triggering airport delays in the nation’s capital and major traffic pileups in Maryland, Virginia and North Carolina. Two people were killed in a chain-reaction accident in Baltimore involving a tanker carrying gasoline that skidded off a highway and exploded, authorities said. Baltimore City Fire Chief Roman Clark said at least 15 were injured in the 55-vehicle accident and tanker explosion, which happened on Interstate 95. Clark said it’s too early to say whether the crash was caused by slick roads, although scores of traffic accidents were reported across the region due to icy conditions. “The roads were very icy,” Clark said. “We have nothing but sheets of ice throughout the city, sidewalks,” he said. Officials have not released the names of the two people killed in the crash. Clark said it’s unclear whether the pileup started before the tanker crash or was caused by the incident. As of 1 p.m., preliminary figures indicated that Maryland state troopers had responded to 330 crashes across the state in 24 hours, the Maryland State Police said in a statement. Between 15 and 20 vehicles were involved in a crash on I-695 near Rosedale, Baltimore County said on Twitter. Six people were taken to the hospital. Maryland Gov. Larry Hogan said he and his wife sent their “deepest condolences and prayers” to the families and loved ones of those who lost their lives due to accidents. The National Weather Service has issued a winter weather advisory for the Baltimore area, meaning that periods of sleet and freezing rain through noon will lead to slippery roads and limited visibility. Indiana authorities say there have been dozens of crashes - two of them involving fatalities - due to freezing rain and ice that’s made the roadways treacherous. Conditions are so dangerous that the Indianapolis Star reports that the city’s police department is urging motorists to stay off the roadways unless it is “absolutely” necessary to drive somewhere. Central Indiana will remain under a winter weather advisory until 7 a.m. Sunday, CBS Indianapolis affiliate WTTV reports. A window was expected in the afternoon in which streets would be wet, but temperatures were expected to fall below freezing into the evening. The state police says it has responded to at least 180 crashes since late Friday night, including two with fatalities. The number of deaths was not available. State Police in Virginia said 41 traffic crashes were reported in the northern part of the state. It was unclear how many were due to slick roads. One fatality was reported. Two airports serving the nation’s capital were experiencing delays or cancellations on Saturday. Washington Dulles International airport reopened two runways as of 10 a.m. on Saturday after halting all flights and having to close all runways for more than three hours due to icy weather. The airport says travelers should expect residual cancellations and delays. A spokesman for the Metropolitan Washington Airports Authority says Reagan Washington National Airport is operating normally, but some flights may be delayed or canceled due to bad weather along the East Coast. Light freezing rain caused scores of traffic accidents, adding to the road mayhem scattered throughout the Eastern U.S.
Police and emergency workers reported more than 100 crashes overnight Saturday in Raleigh and Charlotte as the drizzle combined with temperatures below freezing for approaching 40 hours combined to create dangerous icy patches. Charlotte police reported two people dead in separate fatal crashes early Saturday, although investigators are still trying to figure out if ice caused the wrecks. 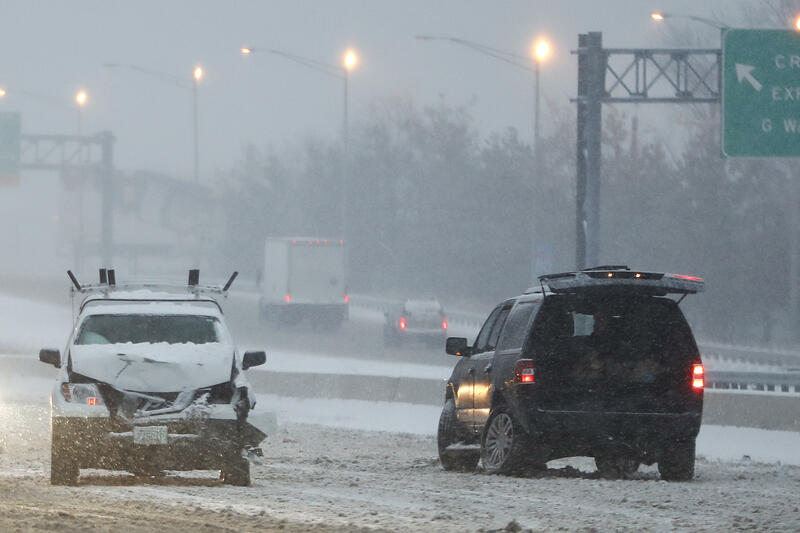 In Ohio, snow and freezing rain created treacherous driving conditions. A Columbus, Ohio, woman died Saturday after her car went off a slick road, became stuck, and then was hit by another vehicle, authorities said. The woman, 20-year-old Savana Carrier, was standing outside her car when she and her vehicle were hit. New York City slowed to a crawl as snow blanketed nearly empty streets on Saturday morning. Up to about 4 inches came down in the city and suburban Long Island after days of bitter cold. By 8 a.m., vehicles were forced to move at a snail’s pace in the heart of Manhattan - or else spin out of control. It took one driver about 10 minutes to get from Madison Avenue near the east side of Central Park to the west side. There were some reports of minor accidents. Temperatures were in the 20s in the early morning when the snowfall started. But by late morning, the snow turned to freezing rain, creating even more hazardous, slippery conditions. The temperatures were in the 30s. The storm was expected to end around 1-2 p.m., and temperatures would slowly rise to a high of 45 on Saturday night, before hitting almost 60 on Sunday afternoon, CBS New York reported. Rain is expected in the afternoon as temperatures rise into the 40s. Residents are bracing for the coldest wind chills they’ve seen in two years. On Saturday night, temperatures in the Minneapolis-St. Paul area were expected to drop to 20 degrees below zero. The National Weather Service said the wind chill will make it feel as cold as minus-35. Forecasters say that in parts of greater Minnesota, temperatures could drop to 45 degrees below zero. Motorists across the state have been advised to stay indoors for the weekend because blowing snow is creating problems in some areas and frostbite could set in within minutes if a driver gets stranded. Meanwhile, much of Wisconsin is under a winter storm warning, as another round of snow sweeps through the state and temperatures plummet to dangerous levels. Weather forecasters say the same for Chicago, which experienced light freezing drizzle and fog on Saturday. The low temperature was expected to plummet to 4 degrees.